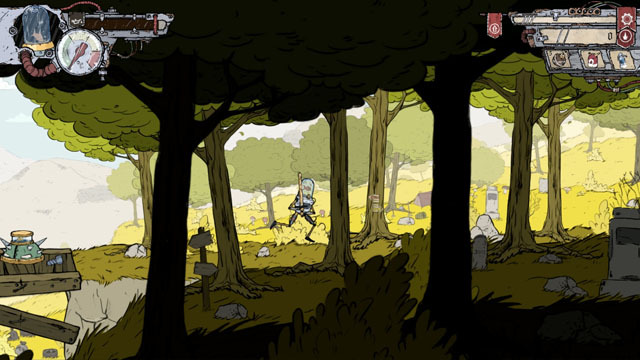 Attu Games, the developer behind Toby: The Secret Mine, returns with Feudal Alloy, a game starring a robot controlled by a fish. The robot smashes his way through a hand-drawn medieval landscape with his trusty sword, destroying mechanical creatures, fighting bosses, and interacting with robot NPC's that allow him to choose his path forward. The game features a robust upgrade tree and dozens of pieces of equipment to increase your damage output, defense, and movement abilities. The game is now available on PC, Mac, and Linux via Steam, GOG, and Humble Store, as well as Switch via eShop. The game is also planned for PS4 and Xbox One.